پورسرتیپ, لادن, ناصری کریموند, صدیقه, مرادی, مصطفی, سوسنی, جواد. (1395). مقایسه تاثیر متغیرهای اقلیمی بر توده های سالم و متأثر از زوال بلوط ایرانی (Quercus brantti Lindl) در شهرستان خرم آباد. مجله صنایع چوب و کاغذ ایران, 7(4), 591-600. لادن پورسرتیپ; صدیقه ناصری کریموند; مصطفی مرادی; جواد سوسنی. "مقایسه تاثیر متغیرهای اقلیمی بر توده های سالم و متأثر از زوال بلوط ایرانی (Quercus brantti Lindl) در شهرستان خرم آباد". مجله صنایع چوب و کاغذ ایران, 7, 4, 1395, 591-600. پورسرتیپ, لادن, ناصری کریموند, صدیقه, مرادی, مصطفی, سوسنی, جواد. (1395). 'مقایسه تاثیر متغیرهای اقلیمی بر توده های سالم و متأثر از زوال بلوط ایرانی (Quercus brantti Lindl) در شهرستان خرم آباد', مجله صنایع چوب و کاغذ ایران, 7(4), pp. 591-600. پورسرتیپ, لادن, ناصری کریموند, صدیقه, مرادی, مصطفی, سوسنی, جواد. مقایسه تاثیر متغیرهای اقلیمی بر توده های سالم و متأثر از زوال بلوط ایرانی (Quercus brantti Lindl) در شهرستان خرم آباد. مجله صنایع چوب و کاغذ ایران, 1395; 7(4): 591-600. 1استادیارگروه صنایع خمیر و کاغذ، دانشگاه صنعتی خاتم الانبیاء بهبهان، ایران. در این پژوهش با استفاده از روش اقلیم شناسی درختی (یک شاخه از علم گاه‌شناسی درختی) تاثیر متغیرهای اقلیمی بر توده های سالم و متأثر از زوال بلوط ایرانی در شهرستان خرم‌آباد بررسی شد. پس از انتخاب 12 نمونه از درختان سالم و 12 نمونه از درختان در حال زوال، از ارتفاع برابر سینه (30/1 متر) دیسکهایی تهیه سپس با استفاده از اسکنر عکسبرداری و پهنای دوایر رویش با استفاده از نرم افزارCorel Draw اندازه گیری شد. سپس با استفاده از نرم افزار TSAPو ARSTAN به ترتیب تطابق زمانی بین نمونه ها و تهیه گاهشناسی منطقه انجام گرفت. از نزدیکترین ایستگاه هواشناسی منطقه، داده های بارندگی و دما تهیه و با استفاده از ضریب همبستگی پیرسون، تأثیر آنها بر روی حلقه های رویش سالیانه درختان بررسی شد. نتایج این مطالعه نشان داد که هر دو سری زمانی از فاکتورهای اقلیمی یکسانی تاثیر می پذیرند و درجه حرارت در طول فصل رویش و پیش از آن روی هر دو تاثیر مشابه ای دارد. تا سال 2010 میلادی روند رشد درختان تقریبا مشابه بوده، ولی از این سال به بعد در منحنی رویش درختان در حال زوال یک افت رویش مشخص مشاهده شد که احتمالاٌ به خاطر تاثیر آفات و شروع پدیده زوال در درختان بوده است. از این سال به بعد علی رغم افزایش بارندگی در چند سال اخیر نسبت به سالهای قبل، افزایش رویش در درختان در حال زوال مشاهده نشد و این به آن معناست که با توجه به تاثیر عوامل ایجاد کننده زوال و در نتیجه کاهش فعالیت لایه زاینده درخت، درختان احتمالاً توان رویش مجدد خود را از دست داده و حتی با بهبود شرایط اقلیمی امکان از سرگیری رویش در آنها وجود نداشت. Allen, C.D., Macalady, A.K., Chenchouni, H., Bachelet, D., McDowell, N., Vennetier, M., Kitzberger, T., Rigling, A., Breshears, D.D., Hogg, E.H., Gonzalez, P., Fensham, R., Zhang, Z., Castro, J., Demidova, N., Lim, J.H., Allard, G., Running, S.W., Semerci, A. and Cobb, N., 2010. A global overview of drought and heat-induced tree mortality reveals emerging climate change risks for forests. Forest Ecology and Management, 259(4): 660-684. Bégin, C., Gingras, M., Savard, M.M., Marion, J., Nicault, A. and Bégin, Y., 2015. Assessing tree-ring carbon and oxygen stable isotopes for climate reconstruction in the Canadian northeastern boreal forest. Palaeogeography, Palaeoclimatology, Palaeoecology, 423: 91-101. Scharnweber, T., Manthey, M., Criegee, C., Bauwe, A., Schröder, C. and Wilmking, M., 2011. Drought matters – declining precipitation in-fluences growth of Fagus sylvatica L. and Quercus robur L. in north-eastern Germany. Forest Ecology and Management, 262(6): 947-961. Zakeri, F., Hojati, M. and Kiadaliri, H., 2012. Analysis of the decline and fall of Zagros forests. Third International Conference on Environmental Planning and Management.Nov.26 Tehran, p117-124. (In Persian). Hamzeh pour, M., KiaDaliri, H. and Bordbar, k., 2011. Preliminary study of Decline of Quercus Branti Lindl in Kazeroon Plain. Iranian Journal of Forest and Poplar Research, 19(2): 363-352. (In Persian). Sallé, A., Nageleisen, L. M. and Lieutier, F., 2014. Bark and wood boring insects involved in oak declines in Europe: Current knowledge and future prospects in a context of climate change. Forest Ecology and Management, 328: 79-93. Dickson, R.E. and Tomlinson, P.T., 1996. Oak growth, development and carbon metabolism in response to water stress. Annals of Forest Science, 53(2-3): 181-196. Drobyshev, I., Anderson, S. and Sonesson, K., 2007. Crown condition dynamics of oak in southern Sweden 1988–1999. Environmental Monitoring and Assessment, 134(1-3): 199-210. Toïgo, M., Vallet, P., Tuilleras, V., Lebourgeois, F., Rozenberg, P., Perret, S. and Perot, T., 2015. Species mixture increases the effect of drought on tree ring density, but not on ring width, in Quercus petraea–Pinus sylvestris stands. Forest Ecology and Management, 345: 73-82. Fritts, H.C., 1976. Tree Rings and Climate. Academic Press, London: 567pp. Bigler, C. and Bugmann, H., 2004. Predicting the time of tree death using dendrochronological data. Ecological Applications, 14(3): 902-914. Dobbertin, M., 2005. Tree growth as indicator of tree vitality and of tree reaction to environmental stress: a review. European Journal of Forest Research, 124(4): 319-333. Hosseinzadeh, J., Aazami, A. and Mohammadpour, M., 2015. Influence of topography on Brant`s oak decline in Meleh-Siah Forest, Ilam Province. Iranian Journal of Forest and Poplar Research,. 23(1):190-197 (In Persian). Hosseini, A., Hosseini, S.M., Rahmani, A. and Azadfar, D., 2014. Comparison between two oak stands (healthy and affected by oak decline) in respect to characteristics of competitive environments at Ilam province. Iranian Journal of Forest and Poplar Research, 21( 4):606-616. (In Persian). LeBlanc, D.C., 1998. Interactive effects of acidic deposition, drought, and insect attack on oak populations in the Midwestern United States. Canadian Journal of Forest Research, 28:1184–1197. Doležal, J., Mazůrek, P. and Klimešová J., 2010. Oak decline in southern Moravia: the association between climate change and early and late wood formation in oaks. Preslia, 82(3): 289-306. Matisons, R. and Brūmelis, G., 2012. Influence of climate on tree-ring and earlywood vessel formation in Quercus robur in Latvia. Trees – Structure and Function, 26(4): 1251-1266. Sohar, K.., Helama, S., Länelaid, A., Raisio, J. and Tuomenvirta, H., 2014. Oak decline in a southern Finnish forest as affected by a drought sequence. Geochronometria, 41(1): 92-103. Balapour, S. and Kazemi, S.M., 2012. Effects of climate variables (temperature and precipitation) on annual growth of Zelkova carpinifolia. 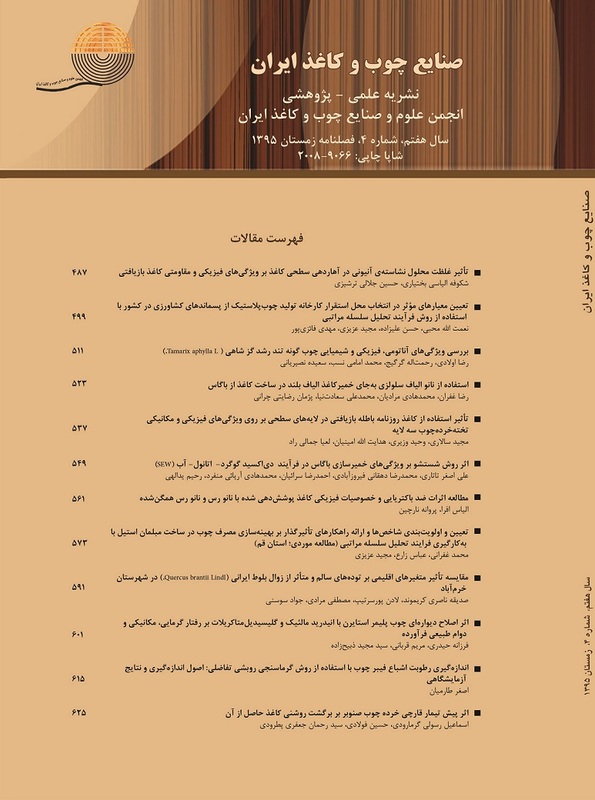 Iranian Journal of Wood and Paper Science Research. 27(1):69-80. (In Persian). Hilasvuori, E. and Berninger, F., 2010. Dependence of tree ring stable isotope abundances and ring width on climate in Finnish oak. Tree Physiology, 30: 636–647. Cedro, A., 2001. Influence of thermic and pluvial condition on the radial increment of Pseudotsuga menziesii Franco from western Pomerania. Tree Ring and people. International conference on the Future of Dendrochronology, Davos, Switzerland. 115 pp. Maekinen, H., 1998. The suitability of height and radial increment variation in Pinus sylvestris (L.) for expressing environmental signals. Forest Ecology and Management. 112: 191-197. Safari, M., Ayubi, E., Bakhshi, R. and Kiaii, M., 2010. The effect of climatic variables on tree rings wood oak (Quercus castaneifolia) (case study: Tonekabon). Third International Conference on Environmental Planning and Management. Journal of Science and Technology of natural resources. 2:105-113. (In Persian).